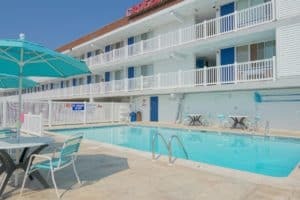 Affordable and kid-friendly too, Ocean City, specializes in the classic American beach vacation. Stroll along the Boardwalk, and you’ll find adrenaline pumping amusement park rides, far stretches of powdery sand, scrumptious blue crabs, and plenty of souvenir shops. 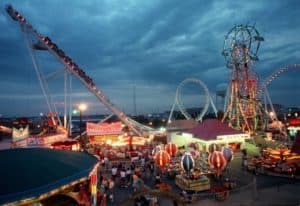 Bright carnival ride lights twinkle as families frolic to Ocean City Beach; intrepid sun-seekers parasail across the water; and the squeals of children are heard playing inside the arcades to Ripley’s Believe It or Not! Museum. But you can power down at Ocean City too. 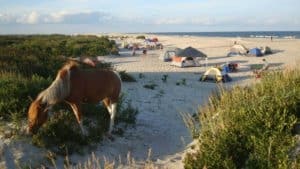 Bait and tackle shops are a surplus, and a daytrip to the serene Assateague Island National Seashore is only a 20-mile drive down the coast. Visit all the best east coast beaches here. 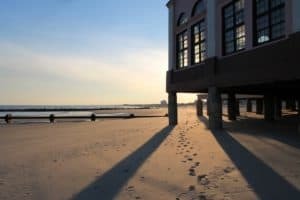 Continue reading and visit Ocean City NJ! The best time to visit Ocean City is from late May to early September, just be prepared for average highs in the mid 80s and a little humidity. There will also be a lot of crowds, and hotel rates that are double the cost of visiting in spring, so consider booking several months in advance. Budget travelers might want to consider the winters: Average low temperatures are in the lower 30s, keeping room rates down. But be warned that local hotels and inns close down for the off-season. This beach is Ocean City’s central location. This gorgeous beach is truly in the heart of all the action. Although it’s typically one of the most crowded beaches during the summer, it’s also one of the most fun. With quick and easy access to all the excitement of the boardwalk, snacks, treats, dining, and amusements, the 9th Street Beach is also right next to the famous Ocean City Music Pier. The local surfing community treasures this ideal beach. It’s a bit off the beaten path on the north end of the island and features an incredible view of the Atlantic City skyline. 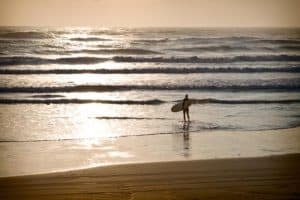 Surfers gather on this beach to enjoy some of the best waves the ocean has to offer. If you’re looking to find a less-crowded, more isolated spot to spend the day on the beach, Waverly is it. And it’s especially perfect for watching surfers. Not too long ago, a pier once stretched out into the sea along this quaint beach at the far south end of Ocean City. 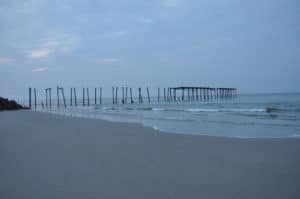 After a storm destroyed most of the pier, pilings stood as a remnant of what once was and became an Ocean City trademark. Now, the pilings have been removed, but the 59th Street Beach still remains one of the island’s best. It’s definitely worth beaching here for an escape from the boardwalk madness, and some spectacular views. This beach is close to the dining and shopping that’s available on 34th and Asbury and West, and it’s a central location for vacationers who live and rent in the center of Ocean City. With quick and easy access to the mainland grocery stores, restaurants, and shopping, 34th Street Beach is a perfect place to spend the day without having to travel far for anything else. This beach is truly a gem, and can expect this beautiful beach to be (mostly) void of human activity. Be sure to pack a cooler because there isn’t anything around. If you’re not one to walk or prefer the supervision of lifeguards, Corson’s Inlet might not be for you. However, for everyone else, this place is one of the best-kept secrets in Ocean City. Even if you’re only passing through Ocean City, you can’t help but spend time on the boardwalk. This kitschy three-mile long pedestrian route is flanked by soft sand and the Atlantic on one side and a mish-mash of hotels, eateries, souvenir shops, bars and rides on the other. Most of the area’s popular sites can be found here, including Ripley’s Believe it or Not!, the Ocean City Life-Saving Station Museum and Trimper’s Rides and Amusements. When the summer rolls around, head to the Ocean City Beach for sun, sand and surf. Running along the entire 10-mile-long east coast of the island, you’re sure to find the perfect spot to spread your towel. If you’re looking for a rowdier atmosphere, recent travelers recommend sticking to the southern end of Ocean City, where the neighboring Boardwalk makes for great people watching and seafront dining. 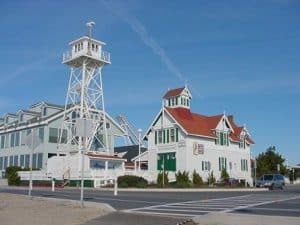 If you’re interested in learning a little area history, head to the southernmost tip of the Boardwalk to the Ocean City Life-Saving Museum. Housed in a former U.S. Lifesaving Service and Coast Guard building, the small yet interesting museum traces this tourist hotspot back to its days as a small fishing village. Here, you’ll see exhibits dedicated to Ocean City’s development, as well as to local sea life and artifacts recovered from old shipwrecks. Since the late 1800s, Trimper’s Rides and Amusements has dominated Ocean City’s entertainment scene. With more than 100 rides — both indoor and outdoor — you’re sure to find something to suit the whole family. Let your tots fly high on the Airplanes ride, or take to the seas in the Bumper Boats. Your older kids might enjoy the thrills of the Avalanche and the Freakout. But because this is one of the most popular spots in Ocean City, expect hefty price tags. “It’s not necessarily cheap, but it’s a lot of fun. Chef Rihl e brought the taste of Hawaii home to the New Jersey shore. 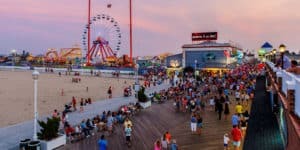 Ocean City, New Jersey is a popular tourist destination thanks to its wide beachfront, world-famous boardwalk and great summer weather. The town is also known for having prohibited the sale of alcohol since its founding, however, and as a result it can be a bit challenging to navigate the local nightlife scene. Each suite and studio is appointed with unique decor including a kitchenette and private bathroom. The variety of units is a key part of the charm, as unique a facility as the town of Ocean City. 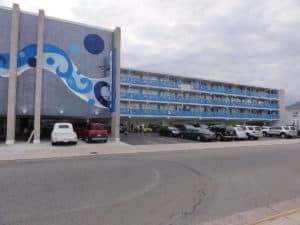 Ocean 7 enjoys an ideal location just steps from the beach and boardwalk with parking for each unit included in your stay. For more information, pricing, or to reserve your room visit the Ocean 7. Featuring free Wi-Fi access and a rooftop swimming pool, this hotel is just under a quarter of a mile from the beach. An on-site garden deck provides the perfect place for guests to relax. Each room includes a coffee machine and a stove, the kitchenettes include kitchenware and a microwave. For more information, pricing, or to reserve your room visit the Biscayne Suites. The Harris House is steps away from Ocean City’s world-famous beach. Along with their unbeatable location, they also take pride in their ultra-clean rooms and facilities and superior customer service. Amenities include a large heated pool, free parking, complimentary beach passes, free Wifi, DirectTV and fresh coffee in the mornings. For more information, pricing, or to reserve your room visit the Harris House Motel. 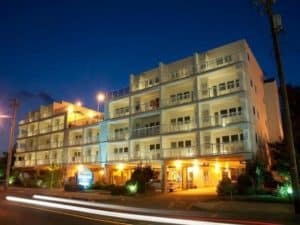 The Crossings is a condominium-hotel resort just steps from all Ocean City has to offer… from lovely beaches and a scenic boardwalk, to fantastic restaurants and unique shopping. Accommodations include 70 privately owned condominium units. The Crossings offers all the amenities you need along with a spectacular location that’s easy to get to. For more information, pricing, or to reserve your room visit The Crossings. Located minutes from the beach, this hotel features free Wi-Fi, an outdoor pool and rooms with cable TV. All non-smoking rooms at Ocean Breeze Hotel have cottage-chic décor. Guests are provided with air conditioning, a refrigerator and a private bathroom. Enjoy a free breakfast includes assorted cereals, bagels, coffee, tea and Juice during summer months. For more information, pricing, or to reserve your room visit the Ocean Breeze Hotel. Ocean city is really beautiful and the pictures are great! Looks like there is so much to do in Ocean City. With the beautiful beaches and things to do, looks like a bucket list item for me. I was surprised by the best time to travel being in September. That fits my schedule really well! I am looking forward to planning my vacation to Ocean City, thanks! Please let me know if you need any additional information Chris. I would be glad you help you find the best prices on all your travel needs to Ocean City. I must say that Ocean City has some beautiful beaches, which makes this a really nice place in my book. I have always told myself from the beginning that I will propose to my wife on the beach. I think that is going to happen this August at Waverly Surfing Beach.it look like a perfect place for me to do that. Thank you for all this great information. Wow, congratulations! That sounds like the perfect place for a proposal. Your bride-to-be will be very happy! Please let me know if you need anything else. Hey Leahrae, thanks so much for your information with your article. Ocean City, NJ seems like such a beautiful place, and one I have never been to! You list everything I need to start planning my Ocean City vacation. Ultimately, I never had a reason to want to travel to the east coast but your article has made me reconsider. Thanks for the info and will be looking out for more updates. Good work! 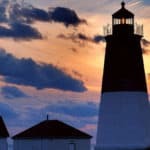 The East Coast of the U.S. has some very amazing places R.J. and you will want to visit Ocean City NJ. I hope you can soon 🙂 Thanks for visiting beach travel destinations. 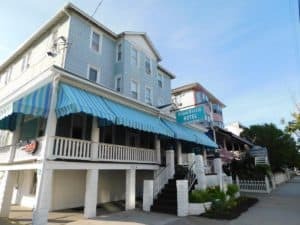 This was a great review of all the things to do, places to eat, and of course the beaches that are to be found when visiting Ocean City, New Jersey. I have been there one time with my family years ago but really did not get a chance to see everything there was to see (kids were pretty young at that time). My wife and I decided to do a nostalgia vacation, and Ocean City came up real high on the list that we put together, This time we will be going as a couple (an old couple, actually as a senior citizen couple! ), so I needed to do some research on the things we missed so we can hit them with this visit. 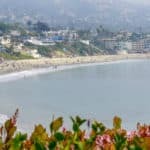 Having run across your website in some of my earlier searches, I knew that I needed to come here first as the other reviews have been excellent and provided a rich plethora of ways to have a good time at whatever beach you were expanding on in a particular post. 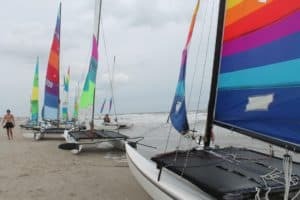 For this Ocean City beach review, you have added so many activities and beaches that now we (my wife and I) will have to pick and choose the ones that most interest us as we will have only four days (a long weekend). We both like beaches in the early mornings, and will get up early enough to see the sun rising, so it looks like the Waverly beach is it. The fewer people the better we think, and due to the early morning, it is likely that we will be almost alone on the beach and can enjoy it together. That is just the start of the day, of course, so we wanted to also get in some sightseeing of nice spits in and around Ocean City. Therefore we have selected the boardwalk (I am sure it has changed a lot over the years since we have been there) and Assateague National Park. We want to see the wild horses, as these will bring back memories for us (kids loved this part). Throwing in some good food will also be a part of the weekend, of course. From the options to overnight you have listed, the Harris House is the one that my wife would like to stay at. This works for me, as it seems the amenities are there and they have that fresh coffee too (the coffee thing is what sold me!). So there it is, once again, you have provided all the important details for our next beach vacation! Thanks so much for what you do, you do it well! Thank you Dave for visiting beach travel destinations and reading all about Ocean City NJ. I am glad you enjoyed and found the information useful for you and your wife. Please let me know if you need any additional information. Ocean City, NJ is a great family vacation destination from what I’ve been told. We almost went there when I went to visit my sister when she lived out east, but we decided to do Hershey instead. I hope I get another opportunity because I think this destination would satisfy every type of vacationer–those that like to relax on the beach, but also those that like to keep busy with activities. Thank you for the hotel suggestions–I think the Harris House Hotel sounds awesome being that it’s so close to the beach. I know you recommended May-September as a great time to go–is there a month that is best for those that would like to go when it is slightly less busy? Okay, the big crowds are going to hit in July and August. So head there in May to June and you will avoid the crowds. Thanks for stopping by Holly! 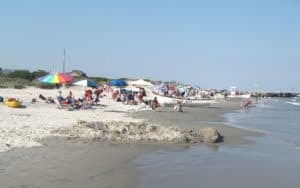 Heard so much about this destination, from the fact that It was ranked the third-best beach in New Jersey in the 2008 Top 10 Beaches Contest sponsored by the New Jersey Marine Sciences Consortium and In the 2009 Top 10 Beaches Contest, it ranked first. My question about the topic is, due to the above fact, are all the beaches free for surf fishing?? I was excited to see Ocean City make your website as a great destination! It has fond memories for me and for my entire family. Every year, for many years, we headed to Ocean City, Jersey, and the fun was non-stop for a two-week period. Boardwalks are my family’s favorites, with only local carnivals coming in second. Rides, rides, games and food! Those things make an exciting, action-packed time, and Ocean City has all of them! Thanks a bunch for your write-up! 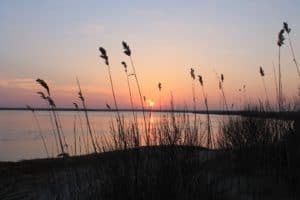 This post is packed with a ton of great information about Ocean City and I know It’ll help a lot when I plan my trip to the area soon. Are there any other recommendations that you can make that might not have made it to your list of attractions and restaurants? Honorable mentions if you will? Boy Buck, my list would be long if I listed the “honorable mentions”. I think I did cover all the good spots though 🙂 If you are planning a trip there and looking for something unique, let me know and I will see what I can come up with! Super Affiliate Indeed! I am impressed and a little biased. How so? I live in Cape May, NJ and go to Ocean City all the time as I have a brother that lives there. I also go for the annual MS walk on Ocean City Boardwalk. March is MS Awareness Month! The video was a nice touch but a little too long. It also seemed to repeat certain views. I think 2-3 minutes is enough. I love that you had the social media icon fly through the screen. Awesome! The email sign up subscription was another sweet feature. I live here in NJ and haven’t visited all the sites you advertised in site. Congratulations on such a beautiful site! Thank you so much Virgie! Thank you for stopping by and leaving me comments as well. This is a great information about beach travel destination. I think I am highly interested in this. That’s make me remember some years ago when my friends and I went to the beach. It was really fun though but the beach I went to last had a lot of trash around the area. You would think people would want to keep it beautiful This area looks beautiful and clean. I am book marking! Thanks. Yes, it’s a shame that some people spend the day at the beach, enjoy it but then don’t pick up afterwards when they are leaving. I walk the beach quite often and take a bag with me. I pick up any trash I see. Always good to do my part. Plastic especially is not good for the marine life. Thanks for stopping by to visit Ocean City NJ. Ocean City looks amazing, I am impressed with the beaches in USA, they always look so clean and vast. I have only ever visited Boston and New England, my favourite beaches in that area were the ones on Martha’s Vineyard, I have very fond memories from there. I love walking along beaches for miles. The restaurants look great too. I am looking forward to visiting this wonderful area. I bet you do have wonderful memories of Martha’s Vineyard! I think you can count on a few more when you visit Ocean City. Thanks for stopping by! Well I’m from South Louisiana and when we say beach automatically, Florida, is the first thing that comes to mind. However this is definitely making me want to pack the family up and head to New Jersey. Not only are the beaches and hotels inviting but everything on the sea walk makes it look even more fun and the food looks delicious. Yes I would tend to agree, because I do live in Florida. But the east coast has so much more to offer than just Florida, and Ocean City NJ is a great example. Glad you enjoyed! 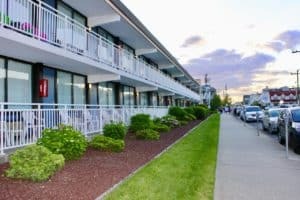 Besides the beauty of Ocean City and all the attractions it offers, what really amazes me with your article is the fact that you thought of everything one might need when visiting it. Your packing list is absolutely perfect Leahrae! I would have forgotten more than half of the things you propose!! Great Effie! I am glad I was spot on 🙂 I use this list or I forget my head when I am packing! Thanks for visiting my Ocean City NJ post. I see there are a lot of activities to do in Ocean City, great we love hanging out on the beaches and eat in restaurants when we are on vacation. The Byscane suit looks stunning from outside, I’ll check this right now. It must be expensive. though. 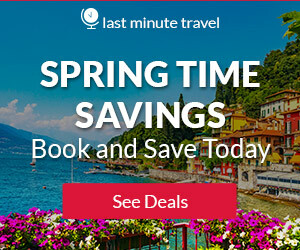 Can we get good deals if we book in advance? Yes, you can definitely get deals if you book in advance. Especially on hotel, and usually on airfare. Please let me know if you need any help planning. 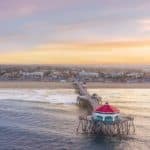 Hi, interesting, I have been wanting to discover Ocean City. So finding your information was great! You have put together all the information that I need. Great Diego. If I can answer any questions, or provide you with any further information just give me a shout!